After Cambodia we headed to Hanoi with a stop in Nha Trang for swimming and sea. Sihanouk Ville beaches had really not been beaches as we understand them. The bus ticket was US 7$ per person from Phnom Penh to Saigon (Ho Chi Minh city). Everything went OK until arriving in Vietnam. Bus dropped us before the border and we walked to Vietnam. Our passports were eligible for free 15-day visas. However, we were offered some kind of tickets in a booth labeled quarantine. Saying no thanks and walking through worked like usually with similar border scams. In the Vietnamese bus stop the company told everyone to pay US 1$ more to resume right away, or wait a long time. Everyone decided not to pay and the journey continued almost right after the incident, with a bit irritated customers. 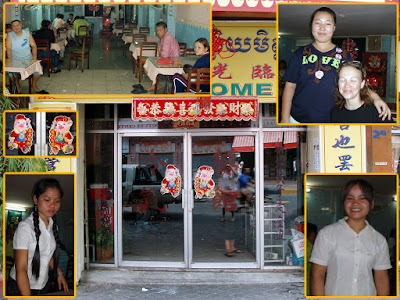 In Saigon we teamed up with Lori, a Canadian teaching English in South Korea and looked around for a bus to Nha Trang. A tour operator An Phu showed nice photos of their bus and promised seats from the middle of the bus. So we ended up purchasing an open ticket covering all the way to Hanoi, allowing multiple stops on the way, lasting one month with US 15$. When the bus arrived to pick us up from the travel agency for the first 11 hour overnight leg, there was a surprise waiting. The bus was full of tiny Vietnamese people who were sitting in the front part of the bus and all the tall foreigners were packed to the back seats. There the floor was raised with a half of the leg space available. It is probably not necessary to mention that there was a bunch of unhappy foreigners when we arrived in Nha Trang after the nightly ordeal. When complaining about this in An Phu office a man who called himself manager promised to make it up by reserving us good seats, if we did the booking one day before. Later, when reserving the seats, we learned that the bus had no seat numbers. This treatment reminded somewhat the OBLOGO experience in Bolivia. Päivi loved Nha Trang beach and swam daily. City had everything we could hope for: sea, beautiful scenery, a nice breakfast buffet, bakery, and reasonable price levels. The beach was clean and perfect for almost a week, but then one day it was filled with Styrofoam, plastic bags, driftwood and rubbish, and we decided to take off. The density of hawkers was lower than average in Vietnam and most of them understood “sorry”. Hanoi, the capital city, was quite the opposite. When arriving, we were greeted by piles of golden brown grilled pigs, or that's what we thought. There were hundreds of them piled in front of some sort of butcheries. On the second sight there was something weird in the carcases: they had noses, body structure, and tails like dogs, and dogs they were. For us that was disgusting not to mention spitting inside buses. Vietnam is suffering from high amount of pickpockets. Our friend Lori's camera and purse were stolen in Saigon. She was disappointed by the police not showing any interest in the robbery. Earlier a couple of our friends from Finland got their camera stolen on broad day light and they have been avoiding Vietnam ever since. We heard similar stories from the fellow travellers we met in the bus. The final surprise was in the border crossing from Vietnam to China. The border was called Dong Dang. There were six officials lined up trying to tear passports into peaces. When we asked them not to intentionally to try break weakly made Setec passports, they got carried away even further. Päivi's passport is now almost totally broken thanks to the Vietnamese border guards. When walking away from Vietnam, they tried again the trick of selling some coupon like they did when we entered. No thanks was again enough to avoid the extra payment and supporting the scam. The whole bus trip through Vietnam from border to border was about 50 hours and US 29$. Every time the bus arrived they tried to leave the tourists to the most expensive hotels, and only after quarreling took us to the real bus stop. Most of the lunch stops were also in expensive restaurants or in local street bars. By the amount of scams Vietnam reminded a bit Brazil, except in Brazil there was less racism toward tourists. So far only Thailand has been more racist. The beach in Nha Trang was also surprisingly similar to Rio de Janeiro Copacabana beach. 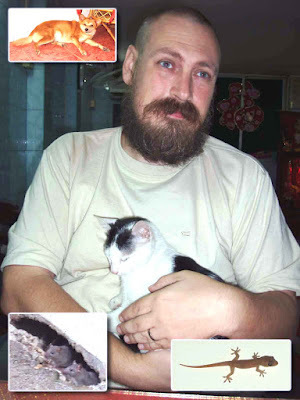 The dog-eating Vietnam is not Santeri's favourite, but Päivi does not rule out another short beach break in Nha Trang. PS. The Internet is censored in Vietnam, so don't plan on updating or reading blogs there, except with www.anonymouse.org. Click here for this anti-war women's group website, and click the image below for the full-size poster of the gorgeous 150-foot woman! Willie "Wild Bill" Storey's recent passing was somewhat personal for me. I live two blocks from the club, am friends with the musicians and employees there, and advised Bill and his wife Lurleen on a couple of club-related issues. I was glad to see so many other people pay tribute to Bill and what he put together; and I felt I could come later with a memorial. That's Jim Dare'-itch.I met this friendly guy at YearlyKos. He lives around here. Watch the video! This question comes up every so often, so I thought I'd pass along what seems to be the best data out there -- from Laumann et al., The Social Organization of Sexuality 311 (1994). All numbers are percentages. We have had a pleasant chance to meet our friends in Cambodia this year. First Bill and Betty came over from the US on their six month tour around China and South-East Asia. 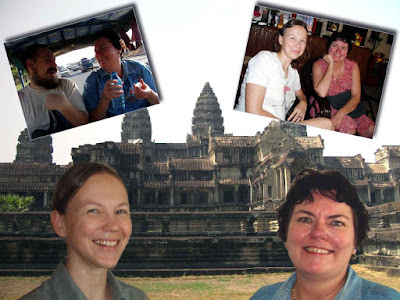 Together we explored Phnom Penh and Angkor, and made a virtual tour to the famous temples. Bill & Betty travel a lot spending around half a year abroad. We met in Buenos Aires, Argentina, where we both used to live. You can read about Bill's and Betty's travels at Bill's blog. After the first of May came Helena who took care of Santeri when he was a baby. Helena is living in Kuala Lumpur where we celebrated last Christmas with her family. Helena used to live in China for some years, and according to her Phnom Penh is very much alike. She had been travelling in the neighbouring countries but this was her first visit to Cambodia. South-East Asia is a very popular tourist destination which may partly explain the astonishing amount of friends we have met here. When we were living in South America, nobody came to see us. From Europe the more natural direction seems to be the east. Of course Thailand still draws most of the tourists in the region, but the situation is rapidly changing. Vietnam seems to have grown more popular, and also Cambodia had 20% more visitors during the first quarter of the year (Source: News Asia). Thailand's volatile situation is an obvious reason for the development, another is Cambodia's flexible visa system. There are no visa-runs unlike in Thailand. Besides, Cambodia is exotic. It is more traditional and genuine as it hasn't become westernised like the neighbouring countries. You can't for example find a McDonald's here which we find especially charming. Instead, you can enjoy some very happy, or even ecstatic pizza with strange herbs, if you like. Cambodia is advertising itself as a bit unsafe and adventurous destination. Land mines and violent past of Khmer Rouge is attracting those who want to prove that they dare. Hotels have signs prohibiting explosives and guns in their premises, and roadside advertisements ask farmers to give away their Kalashnikovs. However, we have found the country secure and relaxed. People are friendly and humble, excluding the foreign NGO trash with their big SUV's trying to hit pedestrians. Money makes people arrogant, and Cambodia is not an exception. Two persons can live in Cambodia with less than 300 € a month. That includes hotel accommodation in a new hotel, two restaurant meals a day, snacks and monthly visa costs. Check out the price comparison between Finland and Cambodia below and see for yourself. As a country, Cambodia is very much like Thailand but without dictators, king worshipping cults, visa-runs and western fast-food chains. There are a few things you might want to know when living in Phnom Penh. Obtaining extension for Cambodian business visa is easy, but the system is corrupted. That was one of the few things that made us feel uncomfortable. Travel brochures, local magazines, and guides advertised that the official way exists, but it is very slow and complicated. We tried the legal way and ended up discovering that the legal way was just a smokescreen. Official price for a one-year visa is US 180$ and the so called express visa costs US 243-280$, depending on where you buy it. Non-immigration office, where we applied for the official visa, was insisting that we have to show them a resident certificate. We discovered that such certificate does not exist any more. The only way to get that piece of paper would be to pay for the tourist police US $50 for writing it. In the end, it was cheaper to buy the express visa which does not require any paperwork and is ready in one day. We tried to find out if anyone had actually got an official visa extension and asked around from the police, travel agencies, local expat newspaper and other foreigners we met here, but found nobody. We wrote a newspaper article about the corruption, took some photos, and made interviews. If you are interested in running the story, please let us know. 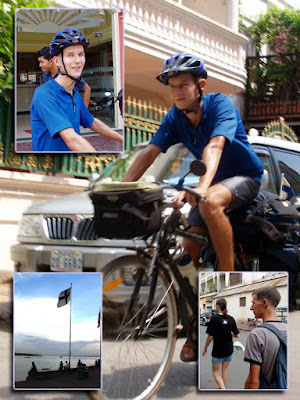 Arto came to see us by bicycle. There are also some smaller issues worth to take into account on a long stay. Some shops, especially bigger supermarkets like Thai Huot, Lucky Market and BIG A -supermarket usually short-change. We are not sure if this happens only to tourists or not, but they usually give 100 riels short. If you ask for the missing money, the manager comes to you and you get the note without any questions asked. This implies that it is a company policy instead of being a little private business of the cashier. Keep a calculator in your pocket to check the change. Having a two currency system (US dollars and riels) at the same time complicates things a little bit. You might also want to check the best before dates of products if there is such information available. For example Lucky Market was happily selling expired condoms and they continued selling them after our complaints. They could not see anything bad in possibly infecting people with HIV by selling outdated condoms that might break in use. It was also sad to witness how western countries spread revengefulness to Cambodians by demanding for the Khmer Rouge tribunals. The rest of the annoyances are similar to most undeveloped countries. There is no public transportation which we solved by walking. The quality of service varies a lot, even with the same service providers. The idea of clean and cleaning is pretty far away from western standards. Our solution was so stick with a small amount of service providers and try to make them understand our expectations. This worked out pretty well. Lack of hygiene, however, was something we could not find a fix for. We talked about writing a booklet about washing hands and not touching other people's food etc., but did not do it in the end. Cambodians love to touch everything with dirty hands, especially things they are not buying or things that someone else is buying. If they drop something to the floor, they pick it up and pack it for you like nothing happened. Insisting changing the product helps, but you have to do it by yourself. Taking these little annoyances in account, we can highly recommend Phnom Penh for a relatively hassle-free long-stay. Now, I've got nothing against those who wax lyrical about tribes. 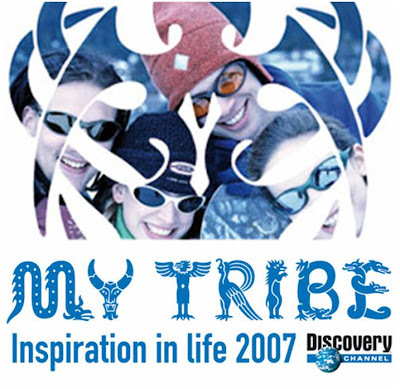 In fact, I subscribe wholeheartedly to tribe hype: we live in a long tail world where tribes multiply by the day, covering every conceivable niche interest. There are real tribes and virtual tribes - with the latter driving the explosion in tribe numbers. But how do Discovery choose to represent this paradigm shift in social relations? With a competition straight out of 1980s Blue Peter. Oh, and don't forget to submit a tribe motto and a picture. Dear God. Did the whole Web 2.0 thing pass these guys by? Or is this their idea of participation, sharing and community in action? That a competition about tribes can be entered by one individual visiting a single website says it all. This should have been an expansive web adventure, calling on multiple tribe members to amass content and solve ARG-type puzzles spread across tribal hubs like Facebook, Flickr and YouTube. It's crying out for collective endeavour; for something that demonstrates the dynamism, spirit and crowd clout that characterise modern tribes. Poor old Discovery. Their brand should be super-relevant to adventurous, experience hungry Diginatives. But this campaign puts them back in their old media, old world box. I'm sure that a few worthier-than-thou, silver ring thing obsessives will jump at the chance to tell the world about their tribe in micro essay format. But c'mon, what about the rest of us? Do you seriously think I want to write 250 words about my tribe, when I could be conversing and collaborating with them instead?